UPDATE: Readers note that JC Penney is tracking the responses to this complaint. Use the AFA-provided numbers: "Make a personal phone call to JC Penney's customer service department. Their numbers are 972-431-8200 (customer service) and 972-431-1000 (corporate headquarters)." I saw this at joemygod.com and naturally I go and read the comments. 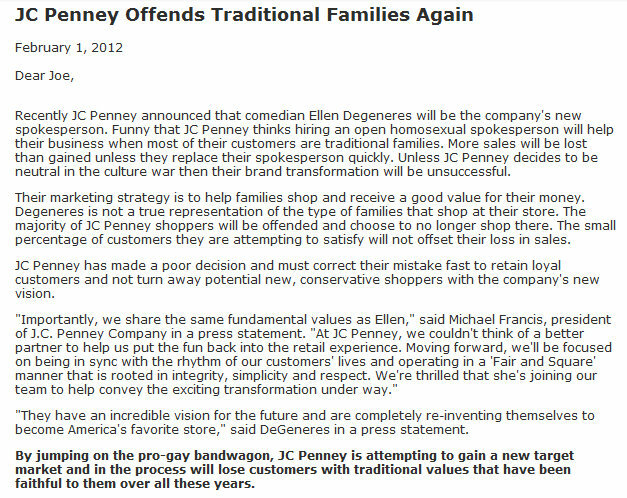 JCP did pull their support of Ellen's show back when she first came out and the LGBT population was ticked off and boycotted them. I don't think JCP suffered much damage. Now, many moons later they are hiring her as a spokes person and the other side wants to boycott them. "The times they are a changin....."
Many people have called to express how great it is that Ellen will be the new face of JCP and there has been a huge sigh of relief from the other end of the phone. It seems that they are getting alot of negative calls from those Mad Moms and would welcome some good feedback. Make your calls today and thank JCP for picking Ellen. 972-431-8200 (customer service) and 972-431-1000 (corporate headquarters)." Possibly the most well-liked, uncontroversial, endearing homo on the planet. The adorable, gee-whiz, actually-uses-the-word-gosh, goofball voice of Disney's friggin Dory in Finding Nemo. She's the human equivalent of a kitten. " I have shopped at Penneys for a long time and have purchased a lot from them. Now its time to oust them from my house. I will cancel my card and will no longer purchase from them. I'm so tired of the gay agenda and the power trip they are on. Penneys has always focused on traditional families. There is nothing traditional about Ellen. She has ruined the networks with her gay agenda over the last 20 years. And now she's ruining Penneys! I am sorry you feel that way. Maybe JPC should hire a twice divorced, single mom with 2.5 kids, unempolyed, and on food stamps as she would be the average American. Traditional families only make up 7% of the population. I hope none of your friends, family, or kids come out as gay because you will make life harder for them if your feelings have'nt already. I will do my best to avoid shopping at JCP. The LGBT movement is degenerative to society and masks the harsh realities of its lifestyle. LGBT cannot be satisfied until their agenda dominates all public domains. They are not looking to be an accepted 'minority'. The human condition is such that those following this lifestyle naturally feel threatened by the vastly superior 'straight' lifestyle which enables natural procreation, global and historical acceptance, and a natural balance of strengths and weaknesses in men and women. This is why LGBT are so easily 'offended' and are first to use dismissive words such as 'haters', 'bigots', 'homophobic' in arguments and open forums. Theirs is an inferior cause and choice and therefore insatiable.